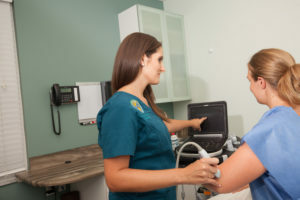 Our centers in Florida and Illinois are utilizing musculoskeletal ultrasound to allow us to effectively visualize and diagnose various musculoskeletal conditions and efficiently treat one joint or multiple joints with Prolotherapy immediately thereafter in cases that warrant this type of technology. Concomitantly diagnosing and treating injured and degenerated joints is an added bonus in particular aspects of patient care. The use of ultrasound at Caring Medical will not replace palpation of the painful joint and the clinical examination, but will be used as a tool to compliment the expertise at hand. Ultrasound guidance can be used before treatment to assess and diagnose, during treatment to inject directly into the injured joint structures, and after treatments-once repair has occurred- to document the successful healing outcomes. We are using the SonoSite ultrasound system, a lightweight, portable point-of-care ultrasound machine, originally created in 1980 for the Department of Defense, as a durable and efficient battlefield unit. The use of ultrasound imaging began in the 1950’s, and was first applied in musculoskeletal medicine in 1972.1 Ultrasound imaging of musculoskeletal structures has continued to advance. The portable high-resolution ultrasound machines, compared to the rather large and cumbersome conventional machines, have allowed for wide access for use in various types of clinics, beyond the traditional context of hospitals and radiology centers. The progress of ultrasound technology includes increased image quality in these laptop-sized machines, as well as lowered pricing for affordability for the average practitioner.With these advances, the ultrasound machine can be brought directly to the patient! Sensitivity in diagnosing rotator cuff injuries. 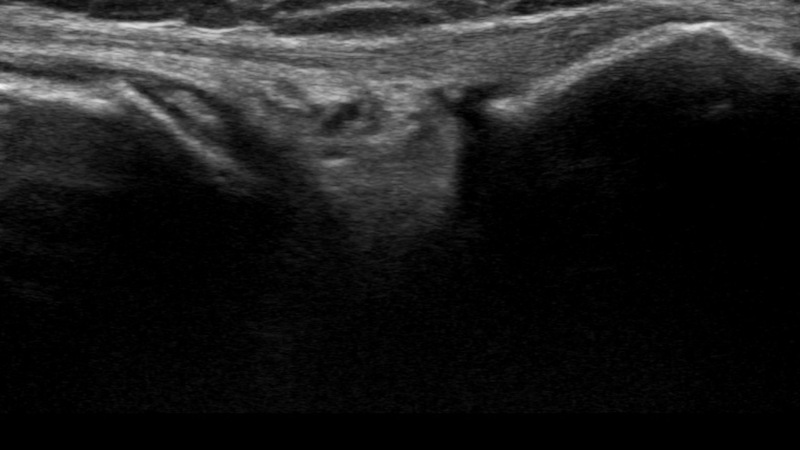 Ultrasound diagnosis and treatment aid in Tendon degeneration and tears. Tendon degeneration on ultrasound is seen as irregularities of fibrillar appearance, such as thickening and fragmentation, focal hypoechoic areas, and calcifications. Accurately visualize and diagnose tendon tears of the upper and lower extremities. Reveals altered anatomy after surgery. In many post-surgical cases, a patient’s anatomy may be altered slightly. Ultrasound is effective for evaluation of soft tissue near metal hardware, which may include metal screws, plates, etc. Monitor needle positioning during the injection procedure. For example, injections into joints such as the hip, as well as soft tissue injections into the tendons, ligaments and other joint structures. In our office, we can check the motion of the “bad” joint versus the “good” joint and clearly document joint instability because the joint motion can be analyzed in real-time. This is excellent for many extremities, including knees where a meniscal tear is suspected, or even smaller joints like fingers and toes. Are there any disadvantages to using Ultrasound? The main disadvantages are operator dependence. The same holds true for MRI, X-ray and any other diagnostic tool. Ultrasound must be used as an adjunct to treatment. Palpation, physical exam, patient history and practitioner experience are paramount. Ultrasound allows us to visualize musculoskeletal tissue. We can visualize the injured tissue right in the office without having to wait for an MRI. During treatment, we can inject the injured structures and maintain continued needle visualization of the targeted areas. The Prolotherapists at Caring Medical, along with many other physicians have been using this same treatment method. During this time, thousands and thousands of patients have had their pain levels improve dramatically without the addition of ultrasound. At Caring Medical, our success rate in using the palpation guided technique is about 88-92%. The many benefits of ultrasound are noted above; however, we try to keep our Prolotherapy -related costs as low as possible. Any added cost can be a financial burden to patients, especially those who require many treatments or those who have multiple joints treated. In addition, patients not receiving insurance coverage for their treatments will have this added expense. The decision to use ultrasound guidance is based on the needs of the individual patient and is not a rule for all. As one of the largest Prolotherapy clinics in the world, we see a lot of the more complicated cases. People come to us in pain! They have frequently seen numerous physicians, received numerous procedures, tried multiple medications and have been subjected to one or multiple surgeries. Upon arrival to Caring Medical, these patients are oftentimes in worse condition than when they started their quest for pain relief. If their anatomy has been changed due to surgery, with ultrasound we can safely localize the altered anatomy, implants, screws and rods, and then treat the injured or degenerated joint(s). Ultrasound allows visualization of pathology during motion. This means that we can watch the ligaments and tendons around the joint through ultrasound as you move. Take a ballplayer for example. They may only feel discomfort when they throw the ball or with overhead movements, but have no pain at rest. With ultrasound, the patient can perform the motion that elicits the pain, while we visualize the joint and joint structures. This allows us to see directly and immediately, any changes that occur in the anatomy during the motion that exhibits pain. We can then treat the visualized musculoskeletal condition with Prolotherapy. As you know, the Prolotherapists at Caring Medical do not rely on MRIs or other imaging. However, in certain cases imaging may be deemed necessary. Some patients may not be able to get an MRI due to metal implants in their body. If someone has a metal implant from a previous surgery, we can still perform an ultrasound to help visualize the pathology without risk of dislodging the implant. Also, in complicated cases, imaging may be advantageous. 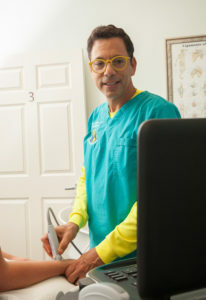 Having the availability of ultrasound is a valuable option. How does ultrasound compare to MRI? Ultrasound has significant advantages over MRI, including hundreds to thousands less money than an MRI. Ultrasound is also preferable to MRI for it’s ability to perform dynamic imaging, or imaging while the joint is in motion. For example, we can evaluate external rotation in the shoulder to diagnose a tendon dislocation or arm elevation to diagnose an impingement or adhesive capsulitis. The elbow can be flexed to diagnose snapping triceps syndrome. Visualization of movement in the hip can diagnose snapping hip syndrome. 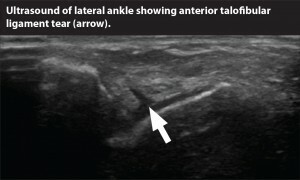 Ultrasound imaging of the ankle can aid in diagnosing a tendon subluxation or tear. In summary, ultrasound is a simple and safe, radiation-free modality that offers the convenience of musculoskeletal assessment right in the doctor’s office. 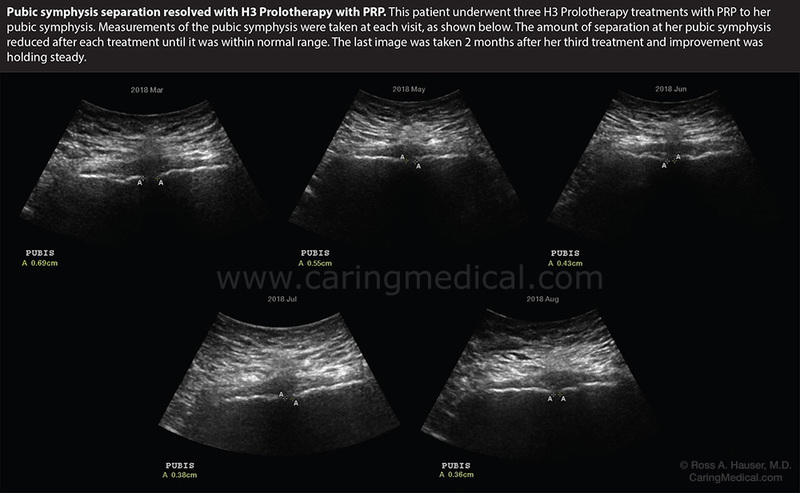 The physician can palpate the injured area, utilize ultrasound to link the imaged area with the patient’s subjective symptoms and pathology, and then treat the visually confirmed musculoskeletal condition with Prolotherapy, Stem Cell Prolotherapy, or PRP Prolotherapy. As treatment progresses, ultrasound offers the ability to document clinical changes, repair and healing of the treated structures. 1.Kane D, Balint PV, Sturrock R, Grassi W. Musculoskeletal ultrasound—a state of the art review in rheumatology. Part 1: Current controversies and issues in the development of musculoskeletal ultrasound in rheumatology. Rheumatology. 2004; 43 (7): 823-828. 2.Lew HL, Chen CPC, Wang T-G, Chew KTL. Introduction to musculoskeletal diagnostic ultrasound: examination of the upper limb. Am J Phys Med Rehabil. 2007;86:310–321. 3.Jacobson JA. 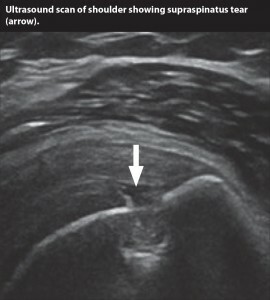 Musculoskeletal Ultrasound:Focused Impact on MRI.AJR 2009; 193:619–627.